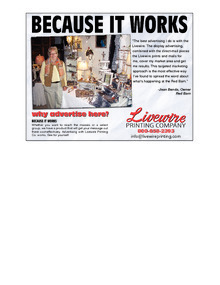 "The best advertising I do..."
Read what Jean Benda, owner of Red Barn, has to say about her targeted marketing approach involving Livewire advertising and Livewire-printed and -mailed direct-marketing pieces. 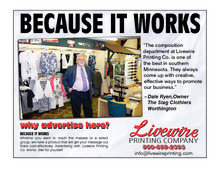 Read what Dale Ryen, owner of The Stag in Worthington, has to say about the composition department at Livewire Printing Co.
Read what Larry Clymer, owner of Jackson Cycle, has to say about advertising in the Livewire and Southern Minnesota Peach. 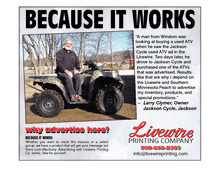 Read what James Kloeckber, owner and sales manager at Fairmont Ford, has to say about advertising with the Livewire and Southern Minnesota Peach. 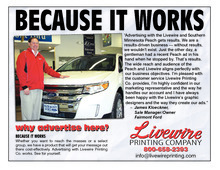 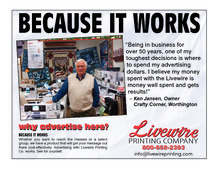 Read what Ken Jansen, owner of Crafty Corner in Worthington, says about advertising in the Livewire.